Rock sugar, also known as rock candy (misri), is used as a spice in many cuisine all around the world and is commonly used in Indian cuisine. You can also use them in your hot beverage like tea or coffee to add a little bit of sweetness instead of using sugar. Many people also use it as prasad. These sugary squares can also be consumed by itself as a tasty snack. These are easy to store and easy to use. This item in Gourmet Indian Food category was first added to our catalog on 02-07-2017. 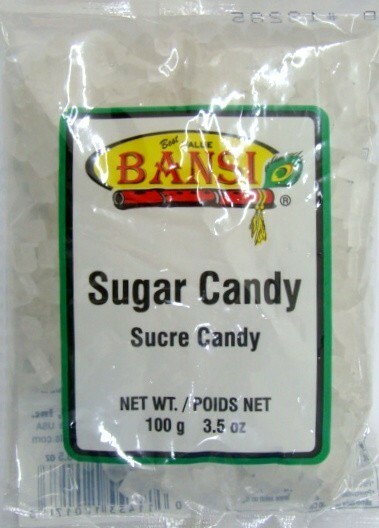 Buy Rock Sugar / Misri 3.5 oz, sold & shipped by Desi Wholesale where you can shop online for Quality Indian Groceries, Spices, Dals & Snacks @ Lowest Price. This Rock Sugar Misri 3.5 collection has been tagged as rock sugar, gourmet food, natural sweetener, misri, sugar candy.